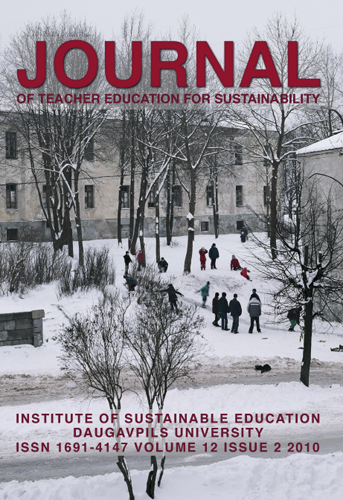 Out Now: Volume 12 (2010) of Journal of Teacher Education for Sustainability! This issue of the JTEFS consists of ten papers that demonstrate the range of methodologies which can be applied to studies in teacher education for sustainability and provide ideas and results from a number of different national and cultural perspectives. I would like to thank all the members of the Editorial board for their hard work reviewing and commenting out the articles that we receive. My thanks are also due to the contributors to this issue for their hard work in the long process of preparing articles for publication. The first paper in this issue by Buchanan and Griffin focuses on students‟ views of opportunities and barriers with regard to maintenance of grounds and management of resources in a tertiary institution context. A cohort of approximately 140 third year primary teacher education students were surveyed to ascertain their views on the value of, barriers to and opportunities for practical sustainability projects conducted by students in their tertiary context. The paper by Kostoulas-Makrakis investigates the discrepancy between the teachers‟ constructivist conceptions and the actual practice. The identified discrepancy seemed to be an outcome of the difficulty in translating constructivism into teaching practice, but also of the misleading conception of constructivism as a homogeneous philosophy. Through reflective practice, the participants were able to deconstruct and reconstruct their theories and practices of teaching in more emancipatory ways addressing issues of education for sustainable development. Inclusion of Roma students in general classrooms at an early age is the focus of the paper by Zaķe. The present paper deals with the development of intercultural learning and anti-bias classroom organization in order to prevent institutional discrimination and promote the benefits of a culturally heterogeneous society. The paper by Strode focuses on teacher training, highlighting the teacher‟s profession as an attractive choice of one‟s career that permits to ensure the development of general and professional skills and an opportunity for new specialists to align with the labour market. As a result, a framework of pedagogical practice organization was created in order to form students‟ independent professional activity. The paper by Luik highlights the implementation of information and communication technology in education via the use of many educational software programs, which every teacher can use with their students. Some learning materials are produced by individuals who are not aware of the pedagogical principles and do not know how to produce effective educational software. The paper by Kuurme and Carlsson focuses on the factors of well-being in school as a living environment according to students‟ evaluation. Theories of the quality of school life and authentic identity constitute the theoretical background of this study. The school experiences of 185 Estonian and 161 Finnish students of different school types were studied by a semi-structured open questionnaire. The answers were analysed by a qualitative phenomenological method. methodology favours applying child-centred pedagogy in the teaching and learning process and supports the sustainability of children‟s linguistic and social development. The paper by Inman and her colleagues discusses and evaluates the experience of the UK Teacher Education Network for education for sustainable development and global citizenship as a community of practice dedicated to introducing education for sustainable development and global citizenship in teacher education in the UK. The article sets out the global and UK policy context and outlines the differing government support and guidance for education for sustainable development and global citizenship in teacher education across the four nations of the UK. The paper by Mifsud attempts to highlight the main processes of the acquisition and development of various environmental perspectives and puts forward suggestions on how youth can be better addressed in the light of the research findings. The research results indicate relatively low positive behaviour towards the environment. The paper by Margo Egne investigates the washback effects of handouts on the teaching and learning process in the higher education institutions of Ethiopia, particularly in Adama University. A descriptive survey and analytical research methods were employed in the present study. The research results reveal that the way handouts are being prepared and used in higher education institutions of Ethiopia does not encourage active and independent learning. Some recommendations which are deemed crucial for alleviating the problem are suggested.